I fell into this book and didn’t emerge until I’d finished it! I’d planned to nose through it on a flight for a while, and ended up ignoring the rest of my airborne world until page 192 – the last page. Let’s put it this way, I was surprised. I’m a motorcycle man, and though I have always had an interest in any form of two wheeled transport, I didn’t expect to be drawn in quite so completely by this book. But back to ‘Frankenstein Scooter to Dracula’s Castle’. Along with his friend Dean and young daughter, Sticky, his wife and 11 year old son set out to ride classic scooters to Istanbul via Hungary, Romania and Bulgaria. Part of the thread of the story is that Sticky and Tracy’s scooters are heavily modified. You don’t have to be a fan of mechanicing to enjoy the tales of inserting motorcycle engines, and all sorts of other mechanical trickery, to enjoy these parts of the book. Much of the work was done by Sticky himself in his shed, and mates helped him out with the rest. Two wheeled camaraderie. The mood and tone of the book are finely set by this. The author has a way of describing things that open up a new world. I loved the, we-can-make-it-work/happen attitude and I really liked the pointy descriptions of things seen along the journey across Eastern Europe. I was fascinated by the challenges a scooter rider has in comparison to a motorcyclist and I loved the fresh, almost ambling way the story of the ride to Istanbul and back is told. You can hear the author speaking and that works very well, but having said ambling, this isn’t a lazy meander in any way. 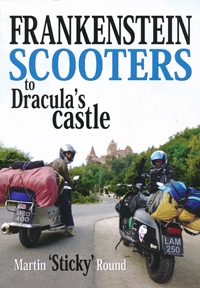 ‘Frankenstein Scooter to Dracula’s Castle’ buzzes enthusiastically, and it pulls you almost magnetically on the journey. Sticky peppers the story with a wide band of wit which includes outrageous comments, sarcasm that at times is excellently close to the edge, and Buster Keaton slapstick moments. He’s also not afraid to laugh at himself. A very British trait? Whatever, it’s a fine mix. All of this is wonderfully enhanced with keen observations on the people they come across, their cultures, their lands, the riding conditions, border crossings, paperwork, planning, places to stay, and so on. Valuable stuff, as is the honesty over mistakes made. For me it’s these things that turn the book from being about riding scooters in foreign lands, into a travel book with a difference. The book also has some very good quality colour photographs. In the main, these are placed at exactly the right moments within the tale and that I liked a lot. You may not have the slightest interest in scooters as a form of transport and you may understand very little about them, but I’m willing to put money on the point that by the time you are even half way through this book you’ll be scratching your chin and considering the possibilities. If you have an interest in wheels and travel, I think you’ll enjoy this book. Happy Christmas & a Happy New Year!